The company sees the greatest opportunities for profitability and value creation in transport infrastructure. Shareholders’ Meeting authorizes sale of Services division. And approves “Ferrovial Flexible Dividend” program. Rafael del Pino, Chairman of Ferrovial, advocated concentrating investments in transport and mobility infrastructure, at the company’s Shareholders’ Meeting held in Madrid. The shareholders approved all the items on the agenda, including the financial statements; the appointment/re-appointment of directors, including the chairman and CEO; the proposal to divest the Services division; and the “Ferrovial Flexible Dividend” program. The Chairman discussed the performance of the company’s infrastructure assets, which logged improvements in traffic, profitability and user satisfaction. Last year, those assets contributed €487 million in dividends, or €623 million if the figures from Services projects and others are included. NTE in Texas is scheduled to start paying dividends in 2019. Del Pino discussed the main projects that commenced in 2018, such as the inauguration of North Tarrant Express 35W in Dallas-Fort Worth; initiation of construction on Denver airport international terminal; start-up of 407 East Phase 2 operation; and partial inauguration of the Toowoomba Second Range Crossing in Australia. He also highlighted the UK Parliament’s green light to expand Heathrow. With respect to the sale of the Services division, the Chairman stated that “it is due to the decision to concentrate our material and human resources on what we do best, namely developing private infrastructure. The market welcomed this change,” he concluded. Del Pino told shareholders that, with the current share price, which is just over €21, and the dividends distributed in the 20 years since the IPO, shareholders have seen their investment increase in value 6.4-fold and obtained a cumulative annual return of 10.4%. He noted that Canadian toll road 407 ETR is also celebrating its 20th anniversary as a Ferrovial asset — “that was a milestone in Ferrovial’s international development” as it enabled it to undertake significant investments in the English-speaking countries. The company has a sound financial position with which to address the changes. Ferrovial ended 2018 with a net cash position of €1.236 billion (excluding infrastructure project debt and including that of Services). Consolidated net debt stood at €3.649 billion at year-end. On a proportionate consolidation basis, which provides a more accurate picture of the company, Ferrovial obtained 86% of revenues and 88% of EBITDA in international markets. Revenues in the United States amounted to €1.717 billion in 2018. Íñigo Meirás, CEO of Ferrovial, noted the good performance by the company’s main assets, traffic growth on toll roads in the US, Canada and Europe, and the increase in passenger numbers at Heathrow and the UK regional airports. He also discussed business performance and order intake in new markets. Meirás highlighted that, on the basis of proportionate consolidation of continuing operations, Toll Roads account for 47% of EBITDA, Airports for 43% and Construction for 10%. As for geographic distribution, applying the same proportionate consolidation approach, North America accounts for 32% of revenues, the United Kingdom for 22%, Poland for 16% and Spain for 14%. He also detailed the contracts that Ferrovial obtained last year, such as the IH-35 extension in Texas, expansion of the contract with Australia’s Ministry of Defence, expansion of Ruta 25 in Chile, and a number of contracts for road construction in Poland and for road maintenance in the United Kingdom. The CEO discussed the division’s contribution during the year, noting strong growth in revenues from toll roads 407 ETR, NTE and LBJ; the opening of NTE 35W and Toowoomba to traffic; and the divestment of the Greek toll roads. Referring to the company’s airports, he noted that Heathrow set another passenger record at over 80 million, and the UK Parliament has authorized the third runway. Meirás noted that the Construction backlog was close to €11 billion at the end of the year. Revenues rose 12% overall, and by 15% in the United States and Poland. This division’s main market is Poland, which accounts for 32%, followed by the US and Canada (29%) and Spain (16%). North America accounts for 47% of the backlog. To conclude, Meirás discussed the company’s priorities for 2019, with a strategic focus on infrastructure and mobility in its long-standing core markets, noting that the company pursues profitable growth and financial discipline, with a particular emphasis on cash flow and operational management. The shareholders approved the 2018 financial statements and a shareholder remuneration program (Ferrovial Flexible Dividend) in similar terms to the previous five years, which will be implemented via two scrip dividends. 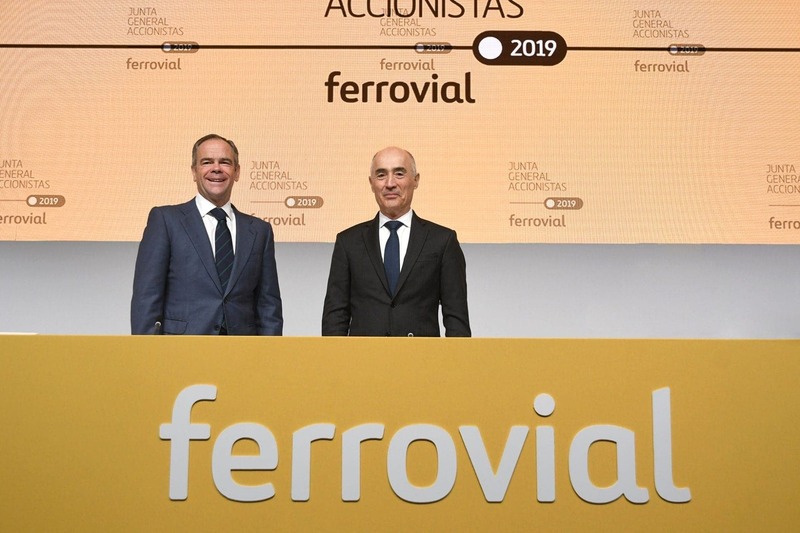 Based on the average closing price of Ferrovial’s share between 30 January and 5 February 2019, that is equivalent to a dividend of approximately €0.72 per share. The shareholders also authorized a capital reduction to cancel existing treasury stock and the shares to be repurchased under a buyback program (at most 19 million shares or €275 million). They also re-appointed nine directors, including the chairman and the CEO, and ratified and re-appointed Bruno di Leo as a director. The shareholders also renewed the authorizations to increase capital by up to one-half of its amount and to issue convertible bonds. The strategic review of the Services division having concluded, the shareholders authorized the divestment of that division’s assets.